Our Split Top Roubo bench plan is based on Andre Roubo's bench from Plate 11 of L' Art du Menuisier, with the added capabilities of Benchcrafted vises. 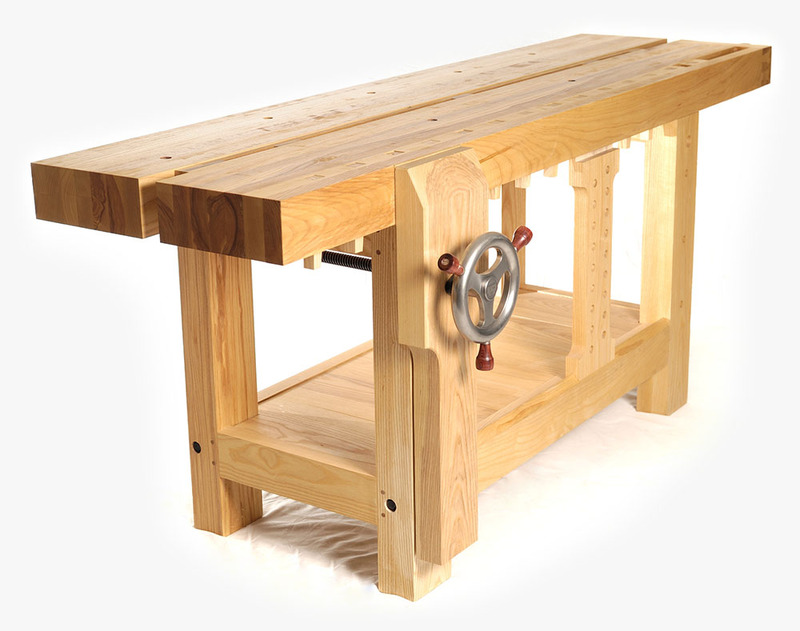 We developed this plan so woodworkers could build a bench using our Tail Vise and Glide Leg Vise without having to figure out all the details. Simply follow the measured drawings and construction notes (available free on our downloads page) and our vises will fit perfectly. 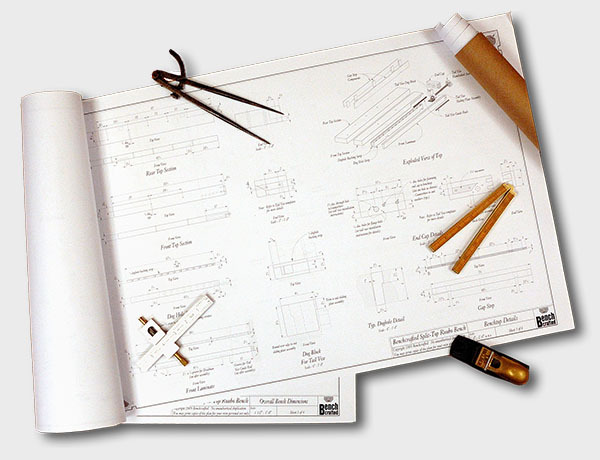 Plans are available on their own, or included with our Benchmaker's Package which includes everything you need to build the Split Top Roubo, except wood. The Split Top Roubo is widely used by professional furnituremakers, teachers and schools, as well as amateur woodworkers. It excels at holding work in the three most necessary positions: for working edges, faces, and ends. The Glide Leg Vise excells at working the edges of boards. 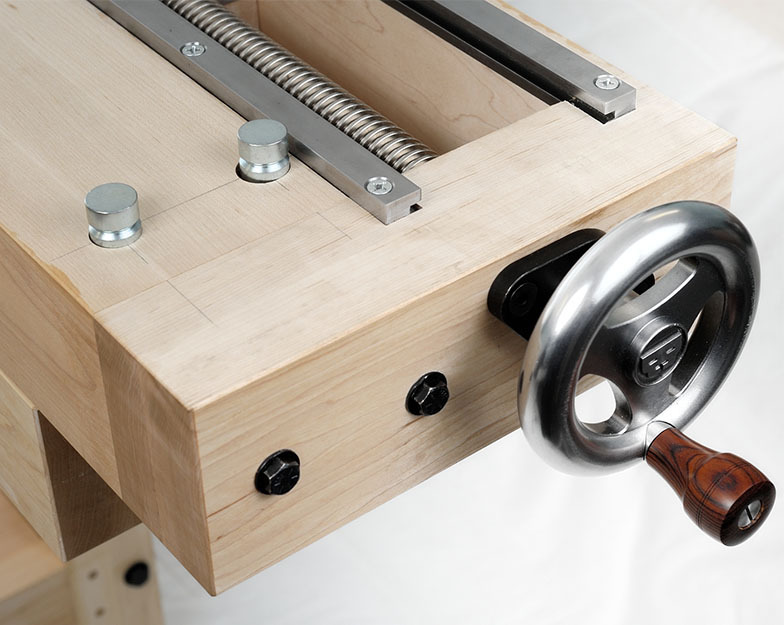 The Split Top Roubo is constructed with massive components. The tops are 4" thick by 87" long. The legs are 3-1/2" thick by 5-3/8" wide with the remaining base elements 3" thick and 1-3/4" thick. The complete bench weighs upwards of 350 pounds. It does not move under the most rigorous woodworking activities. The bench can be built entirely with 8/4 stock if desired. We recommend using hardwoods like ash, hard or soft maple, or beech for their mass and durability. Outfitted with the Benchcrafted Crisscross, workpieces of different thickness are clamped and repositioned quickly and easily without having to change the position of a parallel guide pin. 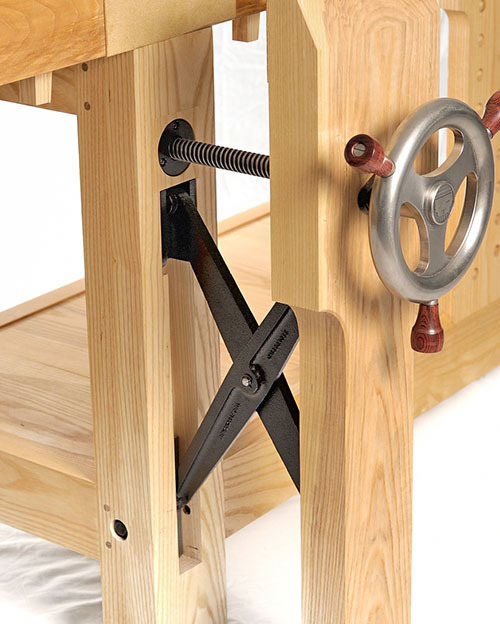 Working the ends of boards is also possible with the leg vise, coupled with the sliding deadman and a holdfast (we use and recommend Gramercy Holdfasts.) Although we prefer the Moxon vise for these operations. The sliding deadman is also useful for supporting the ends of long boards when working on edges. The right leg also features holdfast holes for even more versatility. The Tail Vise is ideal for working the faces of boards, with work held between dogs. 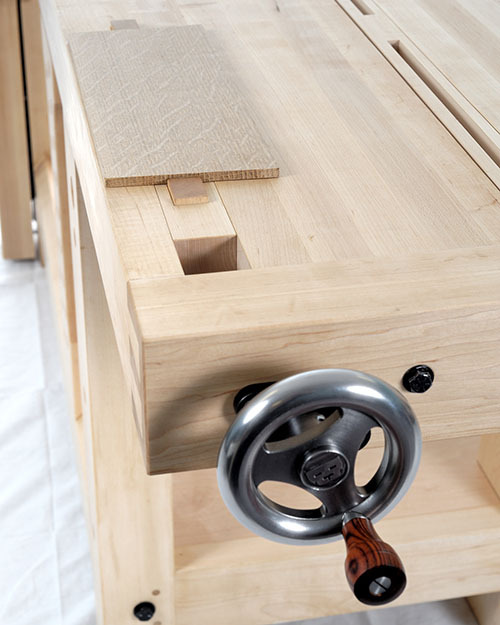 You can also do mallet work while using the tail vise, since the wagon vise design maintains the robust structure of the top surrounding the vise. The first dog is positioned directly over the leg, and allows clamping of very short pieces. This is handy for holding narrow boards across their width for certain operations. An access hole in the leg allows the dog to be pushed up conveniently. The Gap Stop runs down the middle of the bench between the two top sections and features gaps for storing tools. The Gap Stop protrudes above the bench about 1/2" (you can make the Gap Stop any size) and is excellent for working boards across their width. 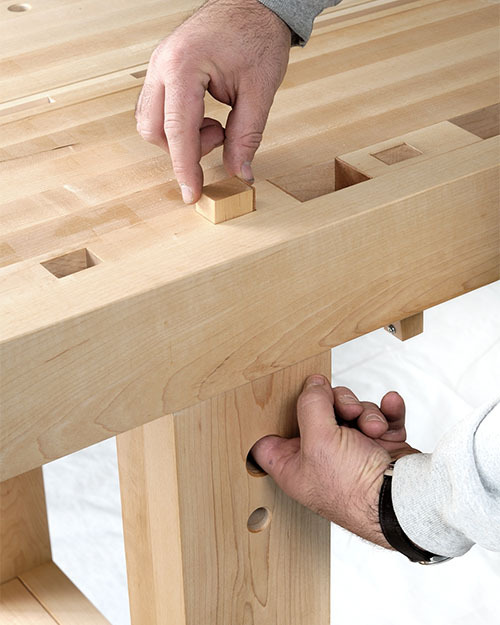 There is no better setup for adjusting tenons. 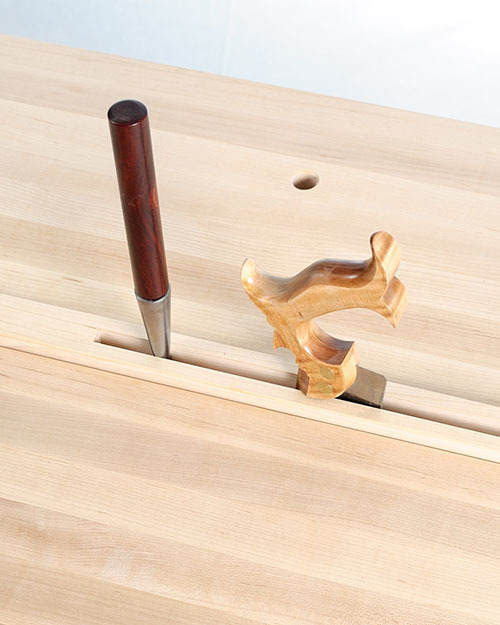 The Gap Stop fully supports the work, allowing the workpiece to be rapidly repositioned for the next tenon. Notches in the Gap Stop allow it sit flush with the tops when the Gap Stop is flipped over and engaged over the base's upper rails. Remove the Gap Stop entirely to clamp work directly to the top between the two top sections. If you prefer an uninterupted surface, simply build a solid Gap Stop. The Split Top Roubo can also be built with one continuous top. 3/4" holes are strategically placed throughout each top section for holdfasts and other accessories. The base elements are joined with drawbored mortise and tenon, with the long rails using our our Benchcrafted Barrel Nuts. This allows the base to break down into four parts for easier relocation. 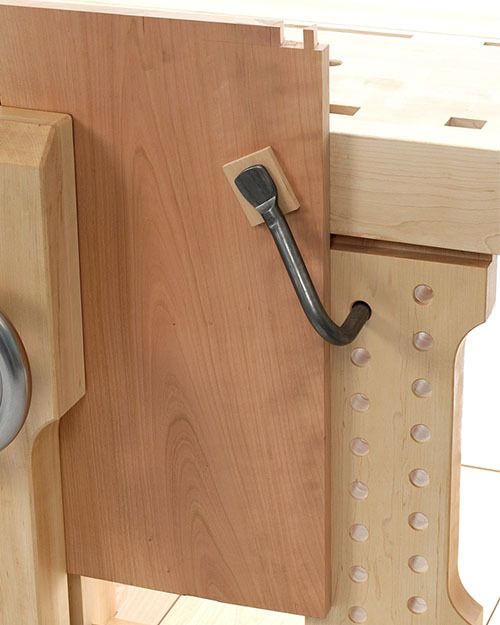 The end cap is also attached with mortise and tenon, and our End Cap Barrel Nuts for easy installation. The protruding ends of the barrel nuts allow installation with only one tool. The tops key onto the base with four massive tenons on the ends of each leg, plus four Spax lag screws. These German-made fasteners are excellent quality, with deep, sharp threads and large washer-heads. Four 20" x 30" printed pages of the measured drawings, showing the bench in numerous views, exploded, and with details of each part. Extremely comprehensive and concise. Printed on 20-lb. bond paper, edge bound, and shipped rolled in a tube, not folded. History, design info, construction notes and techniques, and photos of the completed bench. Get the free construction notes here. This 3D drawing can be rotated and viewed from any angle. You can move the individual parts around and make them invisible or transparent to see exactly how the joinery works or how the vises are installed. If you're familiar with Sketchup, this is very similar. You can download the eDrawing for free here and the viewing software here. What's the total cost to build the bench? In addition to the Benchmaker's package cost, your total will depend on the price of your lumber and how much waste you end up with after the building process. Lumber prices vary widely, so you’ll have to do some math along with a little guessing to arrive at a figure. How much lumber do I need to buy to build the Split Top Roubo? The finished bench itself uses just under 100 board feet. We usually purchase about 150 board feet of 8/4 stock if we can select each board carefully. Some lumber yards won't let you do that. In that case we order 200 board feet and use the surplus for shop projects. Read more. I don't like the split top. I'd rather have a solid, one-piece top, can I do it? Of course. Just ignore the rear top section and build a full-width front section. Simple as that. What species should I build it out of? Short answer? Whatever you want. There are pluses and minuses to any species. We like soft maple as a generally available choice with good durability and workability. Ash, hard maple, southern yellow pine, beech, all good choices. Don’t use soft woods like fir or white pine. What's the large hole at the top of the right leg for? It's an access hole. You insert a finger to push up the dog directly above it. Because they can introduce errors by promoting complacency. Blindly cutting parts without a firm grasp of what the part is and what its function is means you're not really building the bench, but trying to make a kit of parts that will hopefully fit together. It's much better to analyze each stage of construction and understand what the parts are before committing valuable stock. Cut lists are fine, as long as you make one up yourself from the plans. Can I make the bench shorter than 87"? Yes. Just make sure you alter your dimensions properly. You'll need to make the long rails shorter, and this will affect the dog hole spacing. You can also reduce the overhang at the left end of the bench to keep a wider footprint for the base. Don't change the overhang at the Tail Vise end. To add stability on this end (if you drastically shorten the bench) you can offset the right rear leg so its closer to the end of the bench. You'll need to make angled stretchers on the right end assembly. Best way to make the changes is to make a full-size story stick or drawing with the new dimensions right on it. Then you can refer to this in real time when building the bench. Read more. My parallel-head clamps don't fit between the tops, how did that happen? We built the prototype Split Top Roubo with the original Bessey K-body clamps in mind. The later ones (and other brands) are wider. 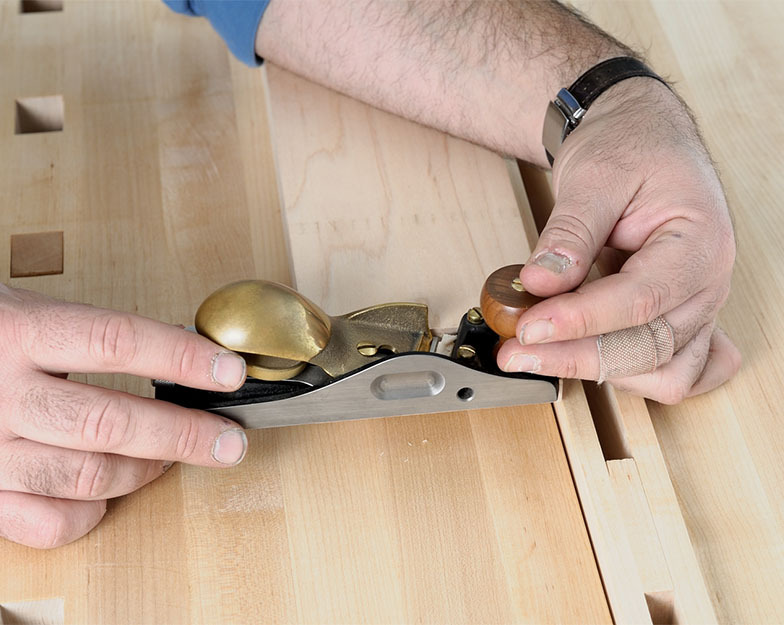 You should build your bench to fit the clamps you have. If you already built your bench and the gap is too narrow and you'd like to make it wider, simply run the front edge of the rear top section over your jointer until your gap is wide enough. From the time you start, until the time you finish. Seriously though,, everyone works at a different pace and with different equipment. Take your time, enjoy the process and you'll be rewarded with a lifetime bench. In our shop, working 8 hour days with a well-equipped shop and our experience, we can build the Split Top Roubo in 5 days. 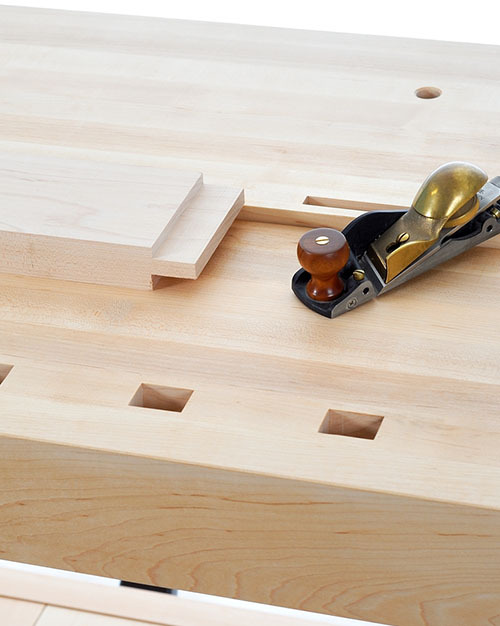 Your bench just looks like a Roubo bench with a couple extra features, why the special plans? We wanted our vise customers to be able to build an excellent bench using our vises, without having to adapt them to others' plans. Benchcrafted vises were designed on a Roubo style bench, so it makes sense that we would offer a Roubo-style around our vises.